This venue is situated in Bournemouth. The nearest mainline station is Bournemouth. 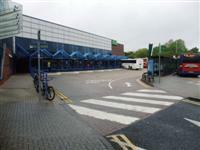 The name of the car park is Bournemouth Station Car Park. 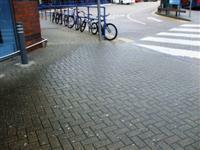 The car park is located at the front of the station, off Holdenhurst Road. 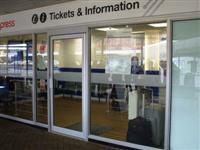 Please see the separate access guide for Bournemouth Station for details on the parking. This information is for the entrance located off Holdenhurst Road. 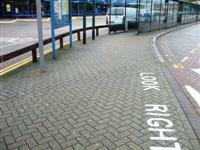 The ramp/slope is located throughout the bus station. There is a steeper slope leading to stands 6 and 7 (photograph 2). You are on Outside Access (Ticket and Information Office Entrance). Skip to the next section. You are on Level Change (Ticket and Information Office Entrance). Skip to the next section. You are on Reception (Ticket and Information Office). Skip to the next section. The desk/counter is 4m (4yd 1ft) from the ticket and information office entrance. There are 17 stands / bays. There are generally 3 member(s) of staff on duty. The station is not staffed between 17:30 - 08:00. There is not an office to obtain help (other than the ticket office). 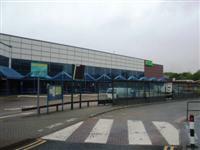 The ticket office / travel centre is located at the side of the bus station, by stand E.
The ticket office / travel centre is 45m (49yd 8in) from the main entrance. 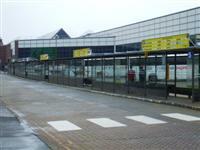 The bus companies operating within this station are National Express, Wilts and Dorset, Bournemouth Airport Shuttle, Transdev Yellow Buses and Shamrock Buses. 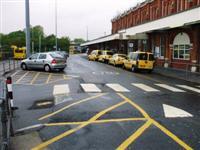 The taxi rank is located between the bus and railway stations. 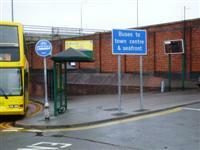 The taxi rank is 25m (27yd 1ft) from the main entrance. 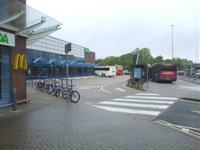 Shops and services within the station include a coffee shop and the Tourist Information Office. 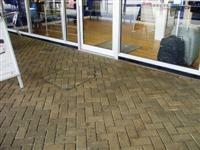 Not all key concourse shops and services have level access. Stand / Bay number(s) 1-7, A-H, J-K. The stands accessed by ramp / slope are 1-7, A-H, J-K. The numbered stands are used by local buses. The lettered stands are used by National Express coaches. 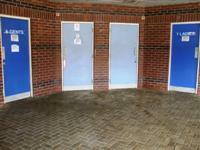 This accessible toilet is approximately 28m (30yd 1ft) from the main entrance. This accessible toilet is located on the left hand side of the station as you enter, next to stands A and B. The key can be obtained from the ticket and information office. The dimensions of the accessible toilet are 185cm x 166cm (6ft 1in x 5ft 5in). The lateral transfer space is 128cm (4ft 2in). 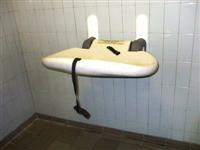 The height of the baby change table once extended is 99cm (3ft 2in). 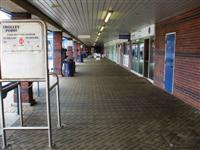 The female and male toilet facilities that were surveyed are located on the left hand side of the station as you enter, next to stands A and B. You are on Level Change (Accessible and Standard Toilets). Skip to the next section.